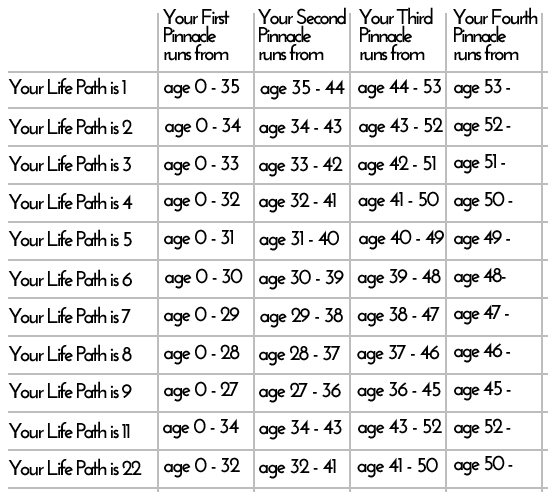 Your Fourth Pinnacle Cycle number is the sum of your month and year of birth. Select the month and the year of your birth in the scroll-down boxes below. Keep focused on your dreams. TYou will have many unconventional ideas and the skill and courage to make them a reality. Your abilities to manage and organize people and institutions are greatly enhanced. You have vision and confidence in the worth of your dreams. These characteristics provide great opportunity for success and major accomplishments. Go on to read your Challenges. Your sensitivity will make you acutely appreciative of beauty and harmonious environments. At the same time, you need beauty and harmony around you. You have an increased appetite for music and the arts in general. You may find that your musical talents coming to the surface. If you do not already play an instrument, give in to any inclination to take one up. A person in a 2 Pinnacle who uses his or her sensitivity, understanding, and insight is very appreciated by others. You may not fully realize just how much others appreciate and respect you. This may cause you to feel undervalued, or that you are not getting the recognition you deserve. Your self-expression is greatly enhanced. Your creative and artistic talents will peak. You should do everything possible to refine these abilities and make the most of them. Many under the 3 Pinnacle are drawn to writing, the theater, singing, and dance. Your chances of success are also heightened. Hard work in any artistic field that one has a talent for can result in much reward. This is a Pinnacle of hard work and many rewards. You must remember that things that last require slow growth. You may mistakenly believe that your progress should be faster, or happen with greater ease. The need for efficiency, orderliness, and methodical systems limit your creativity. Your challenge is to be flexible and adaptable. Learn to play more and allow yourself to be more spontaneous. You must cultivate your talents, especially your verbal and writing abilities. You are likely a gifted salesperson, or promoter. You must accept limitations as a necessary base for your freedom. Freedom cannot exist without limitations, otherwise you would be without identity, and without existence. Your desire to help others is also increased. But this can lead you to poke yourself into situations where you do not belong, or delve too deeply into other people's personal affairs. Be careful not to meddle or interfere. The 6 Pinnacle is a time of progress and growth as a full human being. You are capable of developing yourself in many different directions - as a loving mate and parent; a sound businessperson; and as a pillar of your community. The time requires the balance you possess, since you can easily stretch yourself in too many directions and ultimately feel burned out by the demands in your milieu. Your desire to attain some high degree of perfection is sincere. But that pursuit can make you miserable if you lose perspective and fail to realize the relativity of human existence. Perfection is a Utopian goal, but an unrealistic ambition. It can cause you to be dissatisfied with yourself and others. The 7 provides the possibility of true refinement, insight, and a high degree of wisdom. This deep understanding is the basis for self-love and true happiness. If you are balanced in your approach to money, and have proper perspective, this can be a truly rewarding period, both materially and spiritually. That is the true promise of the 8. The number 8 symbolizes the balance between the finite and infinite, matter and spirit. It offers a great opportunity to grow. Many under the 9 Pinnacle are drawn to religion or philosophy and have the capacity to spread some doctrine or teaching. In short, you are highly idealistic. You will likely travel extensively during this period and meet people from many walks of life. No matter what your area of expertise, you have a chance not only for success but for fame. The influences of this period make you highly creative, innovative, and inventive. You have a completely unconventional approach to problems. Trust your intuition, seek harmonious settings to restore your sense of inner peace, and work hard to keep your feet on the ground. This period will bring great rewards on all levels, and with perseverance you will find your rightful place. The 22 is a Master Number, which means that you must perceive something large in the archetypal world and materialize it. Everything you focus on is large - your plans are big and cover long periods of time; you envision making an enormous and lasting impact on the world. At the same time, your problems and challenges are equally large. You will have to devote yourself entirely to this dream. Without a full commitment to your largest ambitions, you will slip into frustrations and the world of broken dreams.